DC wedding photographers can choose to depict the emotional magnitude of a particular wedding-day moment in different ways. The best option depends entirely on which story the person taking the pictures wants to tell. Sometimes it is enough for a great photo to show nothing more than the scene itself. Some moments are so powerful, moving and impactful that they speak for themselves. In other cases, a Washington, DC, wedding photographer should focus on more than just what is happening. The resulting photos would then reveal how the events are affecting the people who witness them. An example would be a picture of a groom’s face lighting up when he sees his future wife in her wedding dress for the first time. Photographing the scene that way illustrates how beautiful she looks on her wedding day in an indirect but powerful way. A picture of her lets the viewer decide how she looks. A photo of the groom reacting shows how she looks through his eyes. It reveals how stunning she appears to the man who loves her most in the world. Another situation in which so-called "reaction" photos are incredibly powerful are the speeches portion of the wedding reception. We often photograph the bride and groom laughing or crying as their fathers/best man/maid of honor talk. Those images communicate more about the goings-on than a shot of only the person talking. In our opinion as DC wedding photographers, the scene depicted in this photo was also perfect for a reaction shot. Even though what is happening to this bride is not apparent, you see that it is affecting her bridesmaids profoundly. The looks on their faces show that they are deeply impacted by what they are witnessing. They are clearly overjoyed for their friend on the day she is celebrating her marriage. 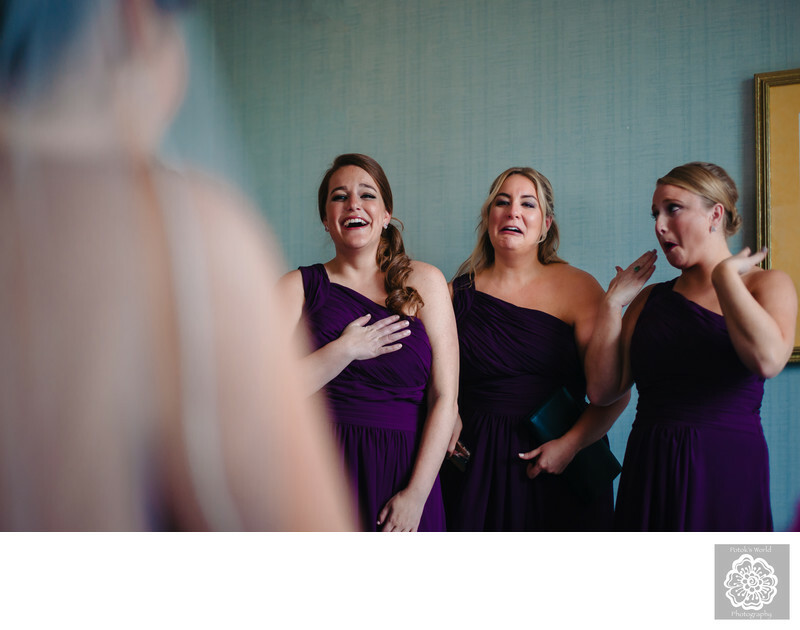 The bridesmaids are also overwhelmed by the depth of their feelings for their good friend. What they were reacting to was the bride reading a love note written by her future husband. He included in a bag of gifts delivered to her suite at the opulent St. Regis Washington, D.C. hotel. The groom-to-be had gotten ready at the Capital Hilton just across K Street from the St. Regis. During that time, we had already photographed him opening the luxury watch that the bride had given him. We also got pictures of him reading the letter that she had so lovingly penned for him. Her words clearly meant something to him, and what he wrote back to her obviously touched her heart. The Washington-based bride started tearing up long before she finished reading his letter. As soon as the tears started flowing down her cheeks, her bridesmaids were overcome with joy. They started crying tears of joy as well. Then the bridesmaids started laughing and fanning their eyes to keep their makeup from running. It was a beautiful, touching, significant and funny moment that we were happy to get on film. We were helped immensely in capturing an image of this moment by the setting. The bride and her bridesmaids got ready in a luxury suite at The St. Regis Washington, D.C. Unsurprisingly, given the five-star hotel’s reputation for elegance, the bridal suite was enormous. That meant we had more than enough space to come around behind the bride and photograph the faces of her best friends. That extra space also meant our photographs were free of the clutter in the background of pictures of brides and grooms getting ready. The result was images like this one. There is nothing to distract your attention from what matters most in the scene: the joy these bridesmaids feel seeing their friend happy. Location: he St. Regis Washington, D.C.923 16th St NW, Washington, DC 20006.